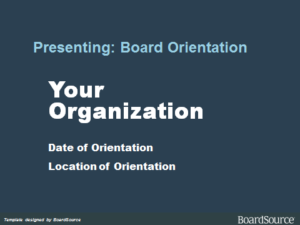 Board education should be an ongoing effort that builds on an effective, formal orientation program and is informed by regular board self-assessment. Continuous — and collective — learning opportunities will help deepen your board members’ understanding of their roles and responsibilities and of your organization and the environment in which it operates, which, in turn, will increase their effectiveness and value to your organization. Unfortunately, board education is often overlooked and underused. 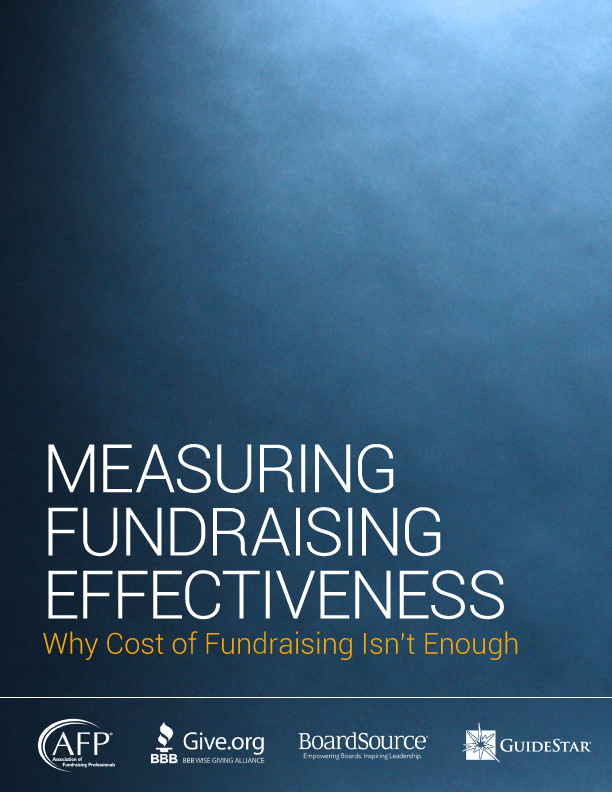 According to Leading with Intent 2017, 69 percent of organizations use written resources to educate board members, while more interactive educational activities — such as trainings, seminars, and webinars — are far less common. 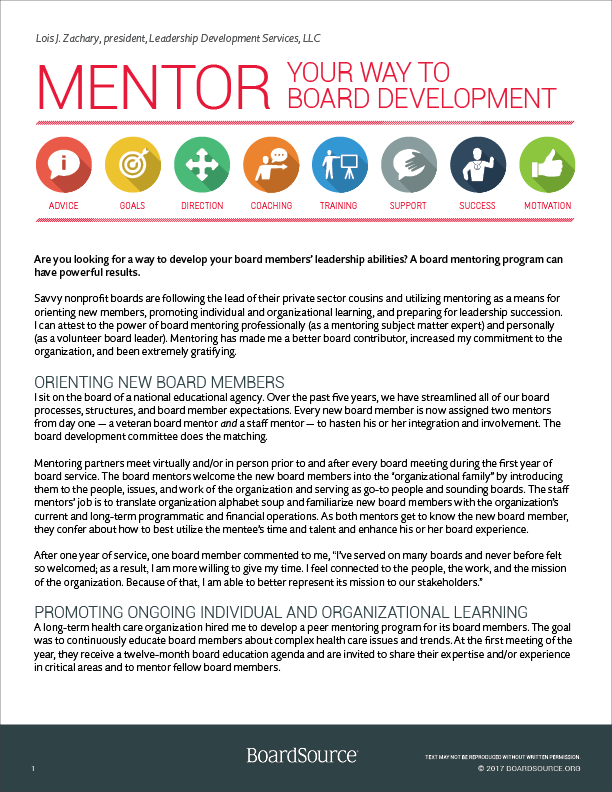 By investing time and resources in board education, you will be able to deepen your board members’ commitment to your organization, strengthen their understanding of the board’s role, and cultivate a culture of ongoing board improvement. 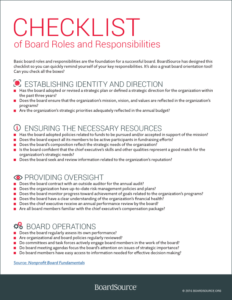 BoardSource recommends all boards formalize a new member orientation process, build educational activities into board meetings, schedule retreats for exploration of complicated issues, and support ongoing learning by providing their members easy access to information about board leadership and governance. 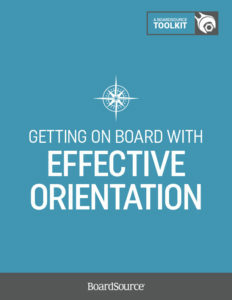 The following resources are designed to help you develop and implement effective orientation and board education activities. 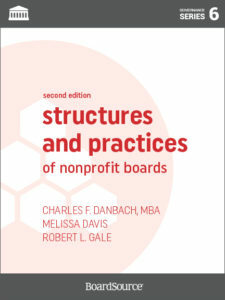 You’ll find further guidance — including information about our Certificate of Nonprofit Board Education program — in the Support for Boards section of this site. 201| Members only resource. As the fiduciary, the board must take special care by making informed decisions and, while deliberating, be mindful of the organization’s potential threats and opportunities. Although the board cannot delegate its primary fiduciary duty, it can allot aspects of its work to other work groups and/ or individuals. As long as the full board retains ultimate control over what’s being done, delegation can be a wise management practice. 101 | Community resource. 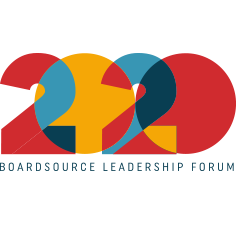 A BoardSource Senior Governance Consultant addresses whether long-term board members should be included in new member orientation processes. 101| Community resource. Every board has a culture that is defined by its customs, traditions, and practices. 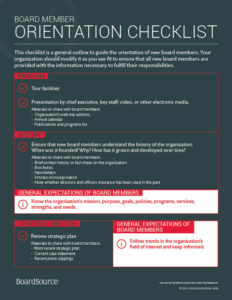 Every new board member needs an introduction to that culture as well as the general expectations placed on individual board members. 101 | Community resource. 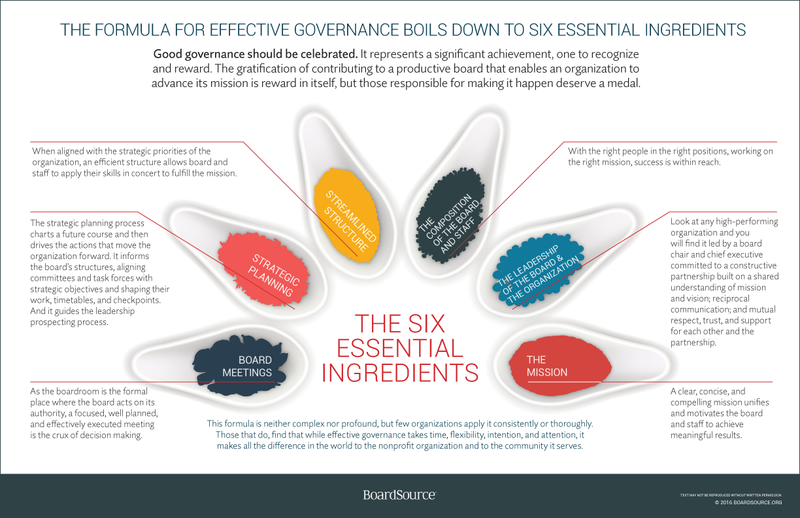 Serving on a board can be a rewarding experience, but is also time-intensive and demanding. 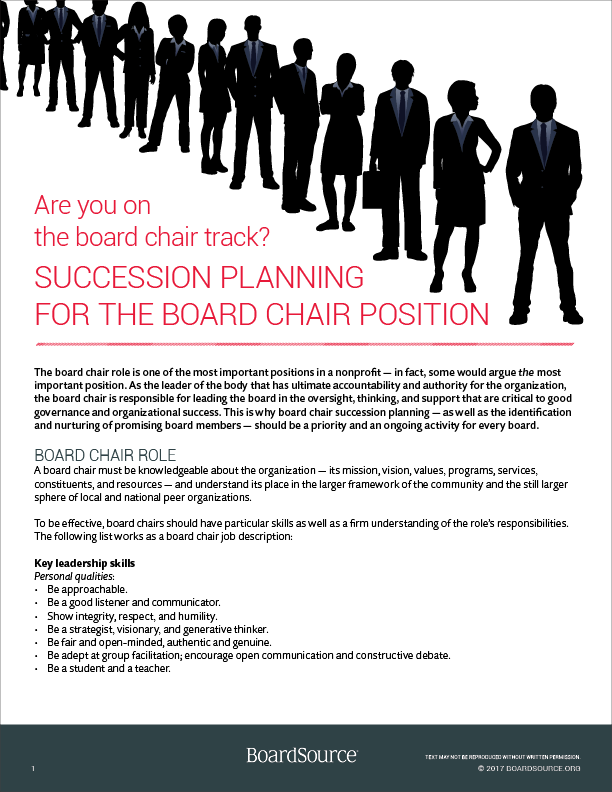 Review these key questions before joining a board. 201 | Member resource. 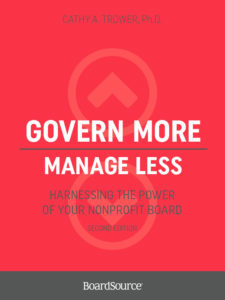 Knowing your board’s level of emotional ownership will provide a helpful indicator as to the amount of training and follow through an organization must invest to ensure that it enjoys the benefits of good governance principles. 201| Members only resource. 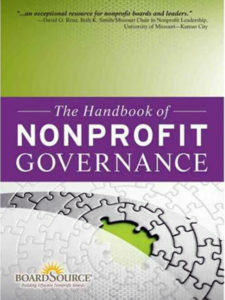 The decision-making power in a nonprofit organization is shared by different entities. The full board resides at the top of the authority pyramid but it is neither realistic — nor desirable — for this group to make every single decision within every organizational activity.